I’d like to invite you to a great opportunity for all ages to participate in Global Missions this summer. On June 18-23 we’ll be taking a team to serve alongside GAIN, the Global Aid division of CRU (Campus Crusade for Christ) in Mt. Joy, Pennsylvania. 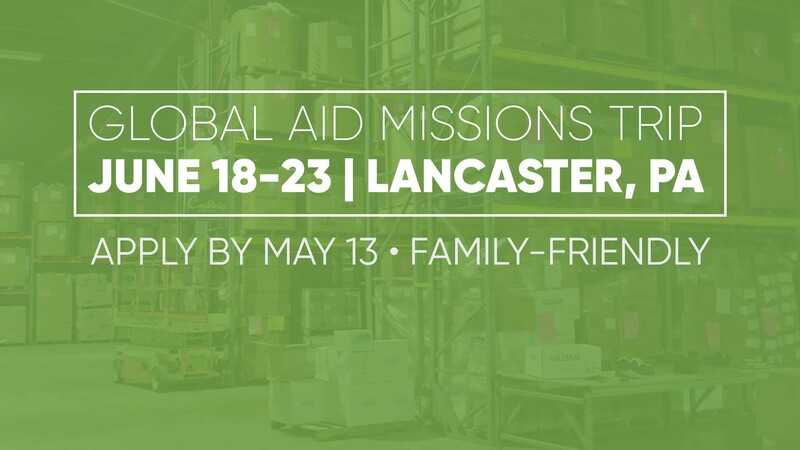 We’ll have the opportunity to serve in their Logistics Center, which operates year-round to receive, process, pack, and ship humanitarian supplies to people in need around the globe. International ministry partners working in the toughest places on earth use these items to express the love of Jesus by relieving suffering, restoring dignity, and revealing hope. We hope you’ll consider joining us and other volunteers for this family-friendly event to engage personally in world missions. Next Sunday, May 13 is the deadline to apply. Click the Lancaster graphic here to apply online through Managed Missions, or email for more information. I look forward to serving with you in Pennsylvania this summer!